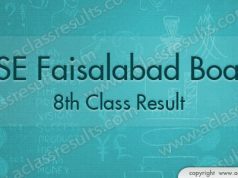 Faisalabad Board 10th Class Result 2018 is declared. BISE Faisalabad Board has been announced 10th class Result 2018. Students may check their www.bisefsd.edu.pk matric SSC Part 2 result online on this page. Search your Faisalabad board matric result by entering the roll number, name or institute name. BISE Fsd conducts the exams and manages four districts Faisalabad, Jhang, Toba Tek Singh and Chiniot. Keep visiting this page to access the recent and latest news for results. FSD Matric SSC part 2 result is announced and all the awaiting students who are ready to get admission in Fsc, ICS or Medical are able to check result. The administration of the institute is working hard to complete the result as soon as possible. We provide the SSC part 2 result of Faisalabad board every year on our website as soon as it is officially announced. Scroll below for the latest top position holder list 2018 as well as the date for the supplementary exam. Find BiseFsd past papers, date sheet, roll number slip and Gazette information Here. Check matric class result in 2018 of some Major Punjab boards including Lahore, Bwp, Multan, Sahiwal, and Gujranwala below. Fsd Board 9th Result can also be checked here. BISEFSD Board of Intermediate and Secondary Education Faisalabad was by the Govt. of Punjab under the Punjab board act 1976. There are 15 members of the Board of Governors of BISE Faisalabad and Chairman board is the head of the board of governors. Faisalabad Board is an independent organization under the control of Secretary Higher Education Punjab to conduct the 10th exams and declare results. Matric Top Position Holders 2018 Faisalabad is announced by the BISE FSD on the result day. Topper students who secured highest marks in 10 class result will gain not only reputation all over Pakistan but also the other incentives and rewards also. Position holders are awarded the scholarships by the Faisalabad board to encourage them to work hard in the future. Chief Minister has announced the incentives and cash prizes to the position holders. Supplementary Examination for 10th class is going to held in the month of September under Board of intermediate and Secondary Education Faisalabad. The Final date of supply exam is not announced yet but tentative date for conduct of supply examination in September. Candidates should apply within ten days after the announcement of FSD 10th class result 20218.